Springtime has arrived in a flaming burst of flowering trees and the sweet scent of magnolia. It came out of nowhere — one day Winter trudged along, the sun low and distant; the next day cherry blossoms burst to fullness alongside the concrete-lined rivers that snake through the city. The flowers are everywhere, like cotton candy at a state fair –magnolias, dogwoods, hibiscus, fruit trees of all varieties — lush plumage animating anonymous, residential streets. Flower boxes have come to life, ablaze with lilies and daffodils and delicate crocuses. A light switch has been turned on in Tokyo. In celebration of the season, I was invited by my friend and DJ partner to join him for a sushi meal in Akihabara. My friend is a Buddhist monk, his family temple in the Nakano ward. The restaurant we were to go to has been owned and operated by the same family for three generations. Three generations of sushi chefs passing on skills and fish market connections. Akihabara is in the low-lying, old heart of downtown Tokyo. For decades, the area has been dubbed “Electric City.” In its heyday, it was a combination of Canal Street and Times Square — tiny shops catering to hobbyists selling transistors, motor parts, computer motherboards and such side-by-side with giant, multi-storied behemoths selling every variety of gaming device, electronic gadget, camera and audio equipment. The smaller, esoteric shops have diminished a bit as the area has turned into a Mecca for otaku culture — the obsessive fans of video game and anime characters. Toy stores and Cos-Play cafes now dominate with hoards of international nerds now roaming the streets with Dragonball T-shirts and neon-dyed hair. (I don’t mean to use the phrase “nerd” pejoratively, but nerds know they are nerds and for the most part seem pretty proud of the title given that they rule the world at this point.) It is a crowded part of the city, ablaze with neon, LCD billboards and high-rise towers. Kanda-Kintarou Sushi is tucked away from the bedlam surrounding the Akihabara Station on a quiet, residential street. The discreet 3 story building, operating for 80 years or so, has been recently renovated inside and out. The restaurant’s facade is clean and new, giving a hushed glow of welcome. The interior is spotless, classic – gleaming pale wood counter and 2 or 3 tables. Larger parties are seated on the second floor. There are no menus. The staff is only family: the chef, his wife and his mother. This is a highly focused group. We are greeted warmly by Chef Takeshi who was busy filleting a long, skinny fish. “Like barracuda,” he told me. “Not special fish. Very common in Tokyo Bay.” There were two jewel boxes on the counter with fresh prawn, snapper and mackerel gleaming. He started us off with a simple broth with 3 clams from Hiroshima. The clams were perfectly tender, slightly sweet and the soup itself was clear and bracing like the ocean itself. Sashimi followed: Aji and thin pieces of tuna taken from the head. The chef tells me that the meat from the head is most flavorful as it receives the majority of blood-flow. To butcher it correctly is the issue and watching him break down chunks of fish, separating the layers, discarding the intra-muscular membranes is equal parts surgery and art. With the same delicacy and discretion, the staff — the chef’s wife and mother — refill glasses of water, change dishes and pour sake. All the wasabi was grated fresh from the root on a shark skin paddle. Hokaido clams, tender octopus, a rare form of aji all passed before us, fresh and magical. 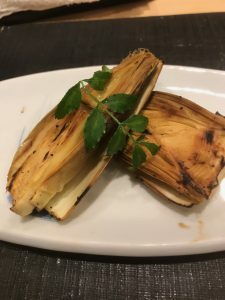 The woody aroma of roast chestnuts or sweet roast corn filled the air as a whole bamboo shoot is served grilled over coals. The tender center is pre-carved for easy access. I eat one bite unseasoned, the next with soy sauce. It is an elemental flavor — the taste of Spring, of tender shoots breaking through the soil to reach the sun. It is sweet, vegetal with a barest hint of pulped wood and smoke. Kaseki is a specific, and ceremonial type of dining. A multi-course offering that celebrates the season and the food that comes with it. 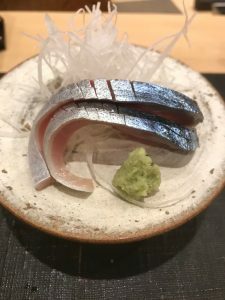 But, kasaki is an ethos in Japan that touches on every aspect of dining from convenience store offerings to most expensive restaurants in Tokyo. Kintarou Sushi is no exception. The blessing of Spring permeates every dish. I watched Chef Takashi, as he gathered together tiny, uncooked firefly squid and some perfectly poached shrimp. He added to them an array of baby vegetables, so tiny that I could not tell what they were. He dressed them in raw egg yolk and delicately split a fiddlehead fern, laying both sides on the luscious mound. The taste was both subtle and powerful, each ingredient showcasing its unique flavor while being united by the richness of the yolk. It was a powerful dish and I wanted to stand up and just clap or yell. I wanted my family to be with me, my best friends from childhood — I wanted them all to be as blessed as I was to taste just how good the dish is. I savored each morsel and licked the last of the yolk off my chopsticks. 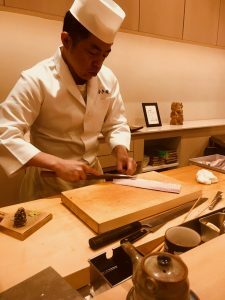 Throughout the meal Chef Takashi had been performing a delicate operation — threading metal skewers through the barracuda-like fish I saw him filleting when we came in. 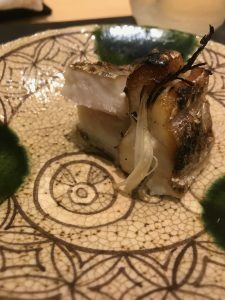 On each end there was a thick slice of daikon (presumably to hold everything together); the fish was sandwiched with finely diced spring onion in between layers, the skewers holding it tightly together. 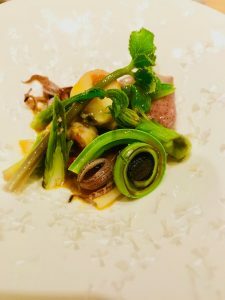 The finished product emerged from the kitchen, roasted over coals — the loose ends of the spring onion charred. Takashi removed the skewers and sliced the fish into four pieces. He plated it and handed it over the counter – the Monk and I both bent over to take in the aroma. “No soy sauce,” he advised. The flesh was soft and airy, the oils melting into the onion. It was unlike anything I have ever had and absolutely profound. I asked if he seasoned it with anything, salt or pepper. He told me no — the onions both absorb all the natural juices and flavor the fish. He reminded me that the barracuda is not special. “Very common fish.” I had to stand up, to get some air, to clear my taste buds, to just take in all the flavors. A seasonal meal like this is etched in impermanence – it cannot be repeated; and dissipates almost immediately. The perfection that is experienced is that of Spring, of watching cherry blossoms at their perfect bloom even as the wind shakes the petals into the slow-moving waters below. It is dining in the tactile dream of a vanishing world.